He served as CTO for a premier conference company and grew projects valued at up to $1 billion. So why did Charles Thiede use paternity leave to quieten the Internet? Following his daughter’s birth, Thiede expanded upon a keynote speech from futurist Gerd Leonhard about the “walled garden concept.” Its premise held that user created content was now driving the Internet, but not adding its full value. Thiede aimed to build an online marketplace to offer industry experts their own blueprint platforms, where they can product great content in a space accessible to new and returning audiences. On Zapnito, businesses and industry experts can create, share, and sell their knowledge using the site as a privately branded platform. This takes Zapnito beyond the publisher realm; it’s really a software-as-a-service provider, in talks with several brands about how to bring great content directly to those who seek certain expertise. 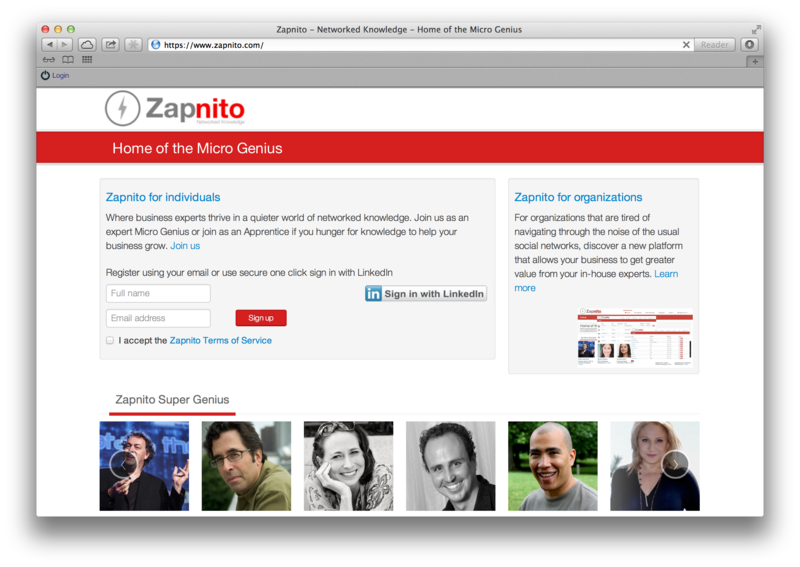 The concept of Zapnito is less about what users see on the site at present. Thiede says that will evolve as “geniuses” from Leonhard to companies like Deloitte create unique knowledge networks to communicate with customers and build their own marketplaces. “Geniuses” on the “Super” and “Micro” levels must apply to be featured, and are categorized based on their followings. “Super Geniuses” like Leonhard are those who bring published books, paid keynote speeches, and several thousand online fans to Zapnito. “Micro Geniuses” are those who aren’t yet stars in their realms of expertise, but have useful knowledge to share with a target audience. When asked if the notion of niche networks and knowledge hierarchies is exclusionary, Thiede replies that each genius has control. Once accepted to be featured on Zapnito, geniuses control how many followers, or “apprentices,” can join their unique networks. “While some of the experts on the platform have large online followings, others are just starting to build their brand and presence online,” adds Dana Reeves, chief orchestrator at Cadenza Marketing Group . “Zapnito supports either scenario with features and tools that help the expert grow in a way that fits with their strategy. Reeves was introduced to Thiede through a colleague who thought she could grow Zapnito with her expertise. Her presence on Zapnito as a Marketing & Branding Strategist has done more than expand her business-it also offers UX perspective. “[Zapnito has] challenged me to look at things not just from a marketing perspective, but from a user experience standpoint as well,” Reeves says. “My involvement has also resulted in some fascinating conversations about knowledge sharing and networking, and the importance of engaging with your audience on a regular basis. Mark Carter agrees. Well before digital storytelling arrived in current form, the Chicago entrepreneur used ONE80 to integrate storytelling into brand marketing . His work with ONE80 exudes passion for mentorship, and involves reaching a community that values it as well. He uses Zapnito to offer strategies for mentors and mentees alike, and joined due to how Reeves pitched it to him. Thiede isn’t fussed by a hard number of geniuses or apprentices. He keeps the initial network small, focusing on people like Leonhard, Reeves, and Carter who have joined not for the exposure Zapnito will offer, but because they share Thiede’s value for networked knowledge. Sans banners, spam, and other advertising, Zapnito aims to give collective knowledge a boost by being the first social network to value it.